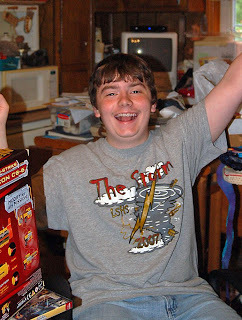 Friday, April 24th was Ian's 15th birthday. It's hard to believe that the baby I once held with amazement that God had actually given him to us has grown up so quickly. Sometimes it seems like just yesterday I rocked him in my lap. We've had so many 'firsts'.... first smile, laugh, camping trip (4 months old), first word (Kitty-cat) and steps (taken cautiously at 1 yr). First days of school, first time meeting your baby brother, first band concert, and now marching band and high school. His mind is so full of creative thoughts and drawings...even if some of it is weird, it's his - therefore wonderful. I thank the Lord every day for blessing our family with him. He's a good kid on the verge of being an awesome man. Lord, continue to bless him, and keep him safe. Help him to grow in wisdom and strength. Help him always to seek Your will & plans in his life. Most of all ~ Thank you Lord for Ian. 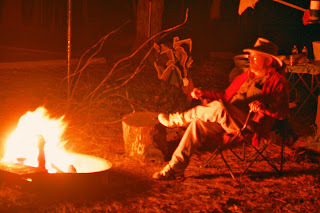 One of the best things about camping - just sitting by the fire. Sometimes we talk, laugh, and joke around. Other times we reminisce about other camping trips and times in our lives. Sometimes we just enjoy the silence...but is it really silent? I hear frogs singing, crickets chirping, a whippoorwill calling, and owls hooting. During the day the hawks & falcons soar high above & call out, bees are buzzing, and there's always the sounds of kids playing nearby. Thank you, Lord for a fun, relaxing,safe, and soul-renewing trip. Your world is an amazing place. Life is good, and camping makes us happy. 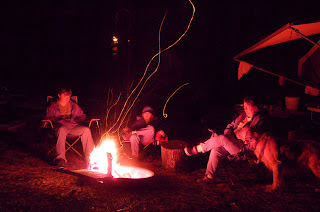 Camping is great - you get away from all the noisy things of daily life & it's demands, and are basically forced to spend close personal time together with your family. This can be good, or bad....I'm happy to say it was good for us. 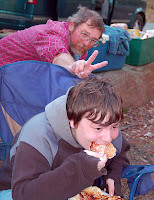 We played some games, read, just sat by the fire, the boys played in the creek, and spring at the Pocket, we cooked & enjoyed some good camping food - pancakes, biscuits, hot dogs, and even pizza! 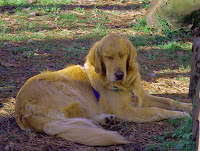 Hiking the trail was such a peaceful, experience - sometimes full of surprises. Riley stirred up a small copperhead snake. EEEK! It was in the rocks nearby where we took this Keown Falls picture. I'm happy to say we parted ways with it with no harm done. A unique little spring was along side the trail. It just bubbled up out of no where - clear & cold as could be, then it trickled down along the trail for about 10 yards & then water just disappeared back into the ground. 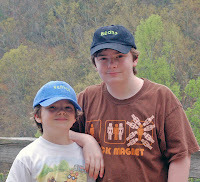 The boys enjoyed tasting fresh spring water...especially on the way back down the mountain when we were hot & tired. Riley thought it was refreshing too...he laid down in it! We went camping in the "The Pocket" a part of the Chattahoochee National Forest / John's Mountain Wildlife Management Area. A really lovely area - all springy & green with new life. While there we hiked up to Keown Falls...quite a hike for these short little legs! But well worth the effort. Blake & Cole also did some fishing. Cole has a unique way of carrying his fishing pole - inside his bookbag, sticking out like a radar. He was quite happy & proud of this wee little fish he caught, too. 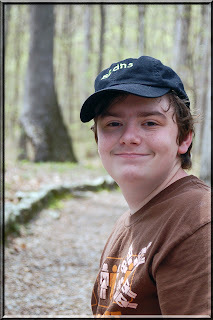 We went camping last weekend for spring break. Although it was a bit early in the spring blooming time in the mountains, we were blessed to see some lovely wildflowers. Blake takes AWESOME flower pictures. He really takes his time & makes these pictures extra special. You can see so many tiny details on these flowers that you would normally just walk right past. 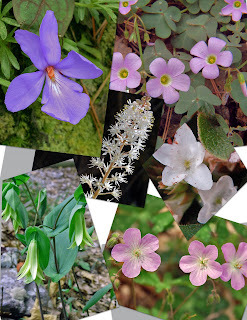 they include wild geranium (one of my favorites), trailing arbutis (which always looks bruised), birds foot voilets, foam flower, star chickweed & purple wood sorrell, fairy or dwarf iris, merry bells, AND an interesting looking unknown flower (the spiral looking one) we found. We can't find it in any of our wildflower books. If & when we figure out what it is, we'll post it's name. 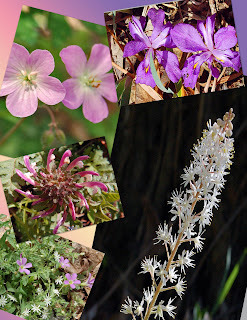 UPDATE - the unknown flower has been ID'd as 'Lousewort' aka Fernleaf or Wood Betony. The Lousewort name comes from an old wive's tale that said cattle would be infested w/ lice after eating this plant. I'm happy to say that is not true, just an old wives tale. FYI - wort simply means flower...even tho' is sounds like an ugly wart. 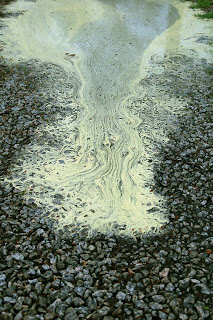 These are pollen puddles. Looks like something from outer space in the close up pictures. It started raining this afternoon. 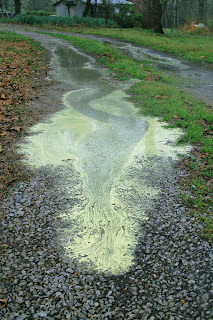 Within a very short time this is what our driveway looked like....rivers of yellow-green. Despite the weather warnings at this moment - we're in a tornado watch - the air feels better already...cleaner, fresher, cooler and much less gritty-green. We all feel better except for Riley... it's thundering. He's hiding. 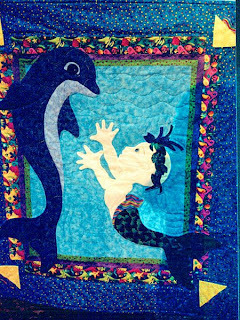 This is my niece Alishia's Dolphin Quilt. I made this for her graduation/Christmas present - as well as Courtney's Fairies (also her graduation/Christmas present) & Mama's 80th birthday quilt all at the same time. We gave them to their recipient's during our family gathering after Thanksgiving in 2005. I worked almost an entire year for this occasion! Alishia loves dolphins, so I searchrf around until I found a pattern/idea with dolphins. I adapted the pattern to my own style - using appliqued dolphins (instead of paper-pieced), and used just about every shade of blue I could find - from palest grey-blue, to deep dark midnight blue for the half-square triangle background. The dolphins are in a shiny, smooth, satiny fabric. This was the largest quilt I've ever made. I couldn't machine quilt the entire thing without engaging in a major wrestling match between me, the quilt, and my standard sized sewing machine....so I divided and conquered. I made the quilt in 2 sections, free-motion quilted it with lots of wave, swirls & whirls, and then joined the sections. IMO, this engineering feat is hardly visible. Even from the back, you have to search for the seam joining the 2 sections. I'll never forget Blake's reaction to seeing the finished quilt lying on our bed. He just stood there gazing at it. When he finally spoke he said, 'Can we keep it?' As much as I would have loved to keep it - I know Alishia has given it a VERY good home. This is my great nephew Rocket's quilt, Finship. Such a fun quilt! I learned how to do Invisible Machine Applique on this quilt - I took a class, and decided it was well worth the effort. I've been using invisible machine applique ever since. I also discovered that quilting is great therapy. My dear Daddy passed away shortly before I started this quilt. The grieving, mourning & depression was somehow made more bearable because I was working on something positive - a beautiful baby quilt, full of life, vibrant with bright happy colors,... for Pappy's first greatgrandson. Rocket arrived just a couple days before his Pappy's birthday. So this quilt has many memories sewn into it. Yes, quilting it good therapy. And it's MUCH cheaper than a shrink!! Yellow and Blue make icky Green! It's Springtime in GA! 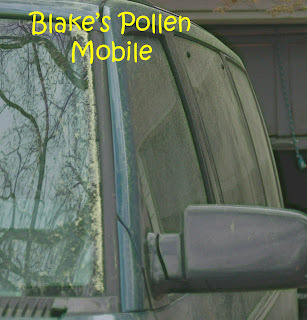 That means many things....Blake has fishing fever, Blake & I both have camping fever, the birds and squirrels are twitterpated, the flowers are blooming, temperatures have mellowed for the most part, but most of all it means POLLEN! These are pictures of Blake's tourquise blue van...but it's not blue now. 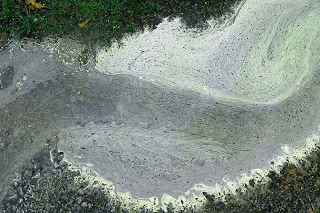 Pollen yellow + blue make a really icky green. 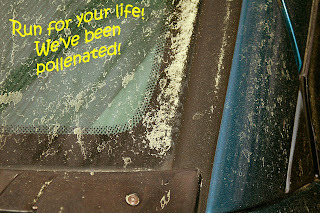 The pollen is so thick you can see it blowing in the wind, covering cars, and all the ponds & and lakes have a layer of icky yellow on top. Our eyes, throat & noses are itchy and sniffley. 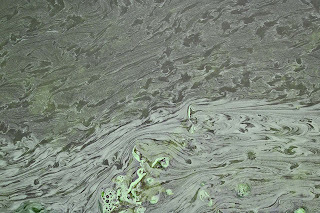 The only cure is a nice rain...which collects it all into "pollen puddles"...interesting, but not pretty. I'd love to open up all the windows & air out the house...but not so long as the yellowy-green invasion is happening outside.